As explained in our Match Formats guide, there is a more advanced version of the Fixed Sets match format, tailored for Free-for-all structures, and especially Battle Royale games. This match format will be selected by default if you pick a Battle Royale game as discipline (Fortnite, PUBG, Darwin Project etc. ), with 4 games per match. If you are not familiar with the notions of Result and Score, please take a look at our quick dedicated article. Time to see what all those new settings are about. It's important to note they follow the same logic as the Calculations from the Match Formats guide, but are a more advanced version of them, allowing for greater freedom. 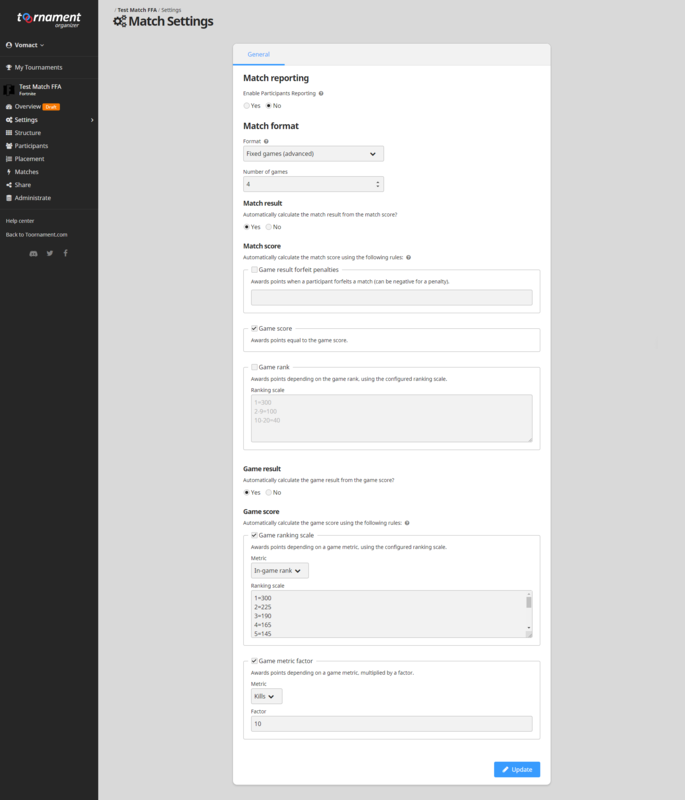 The first one is for the Match Result to get calculated automatically from the Match Score. This is to avoid having to enter both score and result on a match. 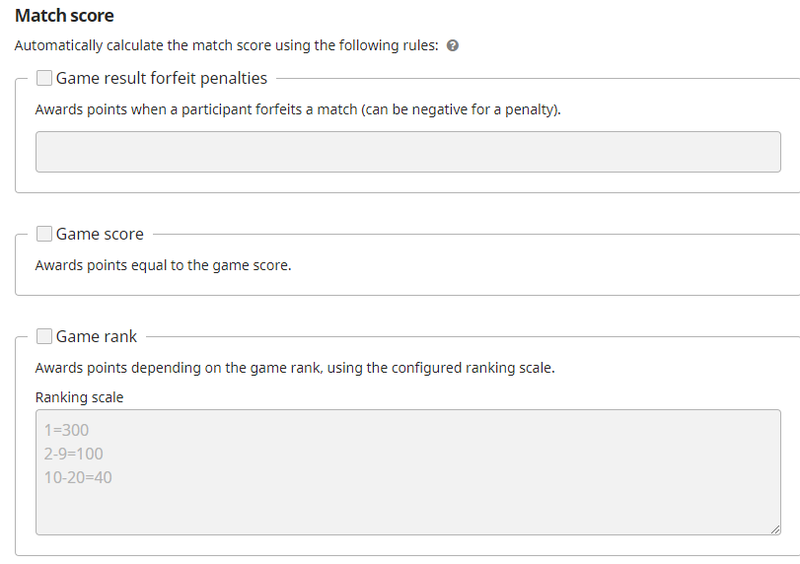 The Match Score category is to set how the Match Score can be calculated from games information. By default, it will simply add all Game Scores, in a flat cumulative way, to represent a standing evolving with each round, that is how Battle Royale usually works. The alternative is to have it assign a Match Score depending on their Game Result. That's the case for most racing tournaments, like F1 championships or Mario Kart where the time (score) is not taken into account, only the position that awards points. Either way, you can add a penalty for forfeited opponents. This option is to automatically calculate the Game Result from the Match Score. This is to avoid having to enter both score and result on a game. 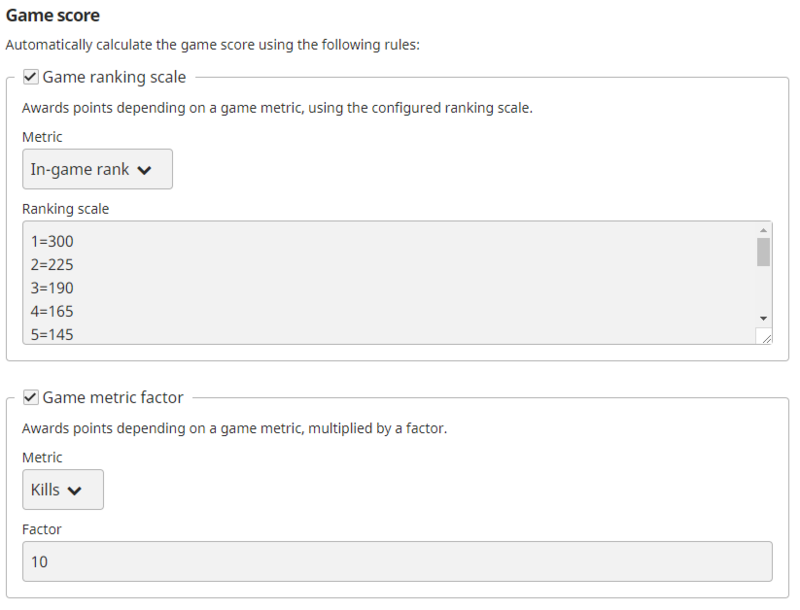 Finally, the Game Score option determines how you distribute points within a game. You may use a Scale and/or a Factor. The Factor is simply how many points you give for a metric (here, how many points per kill). The default values selected are what has been used in the past for Battle Royale Games. If you edit your match format on the Tournament Level, you will have a default scale you can edit, points for each kill. The default behavior only needs you to enter the rank and kills for each game. Game results, Match Score and Match Result will automatically get updated every time you enter a new position or kills value.